Hello dear neighbors, and happy new year! I hope 2018 will bring all of you many happy moments and good health to enjoy them to the full. For us it has started with a wonderful trip (hence my absence from my blog), a gift from our son and his wife, who took us to Japan ! Truth be told, we were a little quite apprehensive to embark on such an adventure ; not only because of the language barrier – my husband had spent the previous two months trying to memorize how to say “thank you” in Japanese!-, but mostly because of our food intolerances / allergies. Well, the good news is we survived, actually my husband better than me even, which tends to confirm that unlike me he does not really have problems with gluten, only with processed food containing preservatives. I will try to dedicate a post to this issue. We still have a hard time believing that we actually went there. We saw and experienced so many incredible things – even an earthquake, 😰, 4.8 magnitude, enough to wake us up and have me worry! I will also try to include some of the photos I took in my upcoming posts. maki sushi, served with different kinds of fish. I loved the tuna and the squid ones. On the top right you can see the marinated ginger slices you eat after each maki to clean your taste buds before you have the next one. Bottom left, a typical bite of a Japanese omelette. You are given a warm wet towel to wipe your hands on before you start any meal; you can barely see it in the top leftmost corner. Anyway, on the first full day that we were back home, I went to the local farmers market yearning for vegetables and at the same time a little nostalgic of some of the delicious dishes we got to enjoy… So I grabbed my recipe notebook, and made this! There are several things I like about it: nothing gets wasted, as both green leaves and stems of the chards are used; adding peanut butter makes the sauce very pleasant and cuts the bitterness of the leaves; and finally the crunch of the roasted peanuts tossed on top is really lovely! 1. Wash, rinse and put the rice to cook. I usually start with this step especially when using whole grain rice, which needs a long time in my old vegetable steamer. Maybe I’ll invest in a real rice steamer some day. 2. Prepare the spices: grate the ginger root in a small bowl, add turmeric and cumin. 3. Wash the chards and separate the stems from the leaves. Chop the stems into small bite size pieces. Put leaves aside. 4. Heat 1 TBSP olive oil in a large saucepan; add spices and chopped stems, stir, add salt, water, tomato paste, and hot pepper sauce if desired. Cover and cook on low, about 10 to 15 minutes, until chards are tender. You will end up with more juices than when you started. 5. Meanwhile, fold and chop chard leaves into long thin strips. I pile and roll several at one time to speed up the process ! Heat 1 TBSP olive oil in a large frying pan and cook on low, stirring. Leaves will shrink and change to a darker color. Season with salt, to taste. 6. Add TBSP peanut butter to chards juices (not the leaves) in saucepan. Stir well on low heat until nut butter has dissolved. All you need now is to toss everything together: rice, greens, and stems in spicy creamy sauce, not forgetting to sprinkle with roasted peanuts. Enjoy! 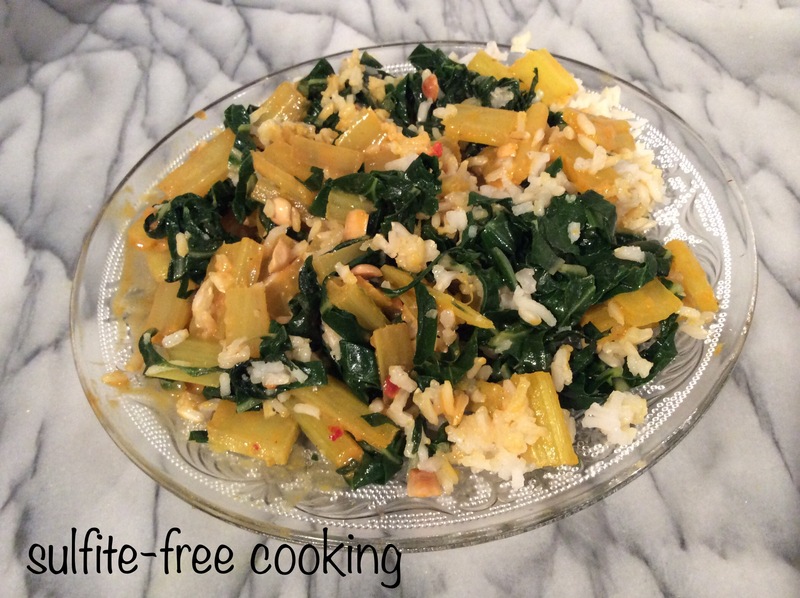 I have made this recipe with both swiss chards and pak choy, the latter being my favorite. But here my trusted organic farmer only had the usual European kind. It’s still very good: my picky husband took seconds! And to finish, this is what I brought back in my suitcase… Except for the tea (a gift from my daughter-in-law’s mom), not sure what I will do with the food yet! from left to right, clockwise: a maki rolling mat; a bag of glutinous rice flour (not gluten), a package of anko paste (sweet red bean paste); a bottle of yutzu sauce; a cabbage shredder; and three boxes of tea. Welcome back, dear Joelle, and I am happy to hear that you had a good time! This looks like a great recipe that I will adapt right away with one modification: I will use my homemade tomato sauce instead of tomato paste. As to the rolling mat you brought from Japan – start rolling, dear friend, and enjoy! Glad to see you back to blogging. I can’t wait to see the rest of your photos. Its a long time back now, but I remember someone saying that glutinous rice flour made a wonderful flour for gluten free roux. I never got to try it myself, but it might be worth looking into. Thank you, Jack 😊. I will have to look into the qualities of this flour a little more before I even open the bag… It would be a shame to have gone so far to get it and then waste it in a stupid experiment, don’t you agree? Over there in Japan they use it to make special sweet treats, I think. There’s an idea! You know, trotting behind our daughter-in-law in the metro and the streets of Tokyo for over a week, we both lost weight 😄! So I think it’s time now for us to go back to French fundamentals… Let’s talk dessert!